In around 3000 BCE, Drividians began to settle along the Indus River Valley. The Indus River Vally was fed by the snow-melt water of surrounding high lands. 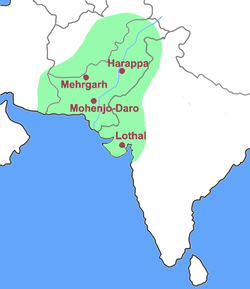 The soil along the Indus River Valley was fertile and ideal for agriculture for the newly-arrived Dravidians. This encouraged agriculture to develop in the Indus Valley Civilisation. These agricultural settlements grew into cities such as Harappa and Mohenjo-daro. From the organised and neat layout of the cities (e.g. Mohenjo-Daro as shown in the picture), it is clear that the Indus Valley civilisation had a strong and stable government which could plan the town and mobilise the manpower in building the cities. Furthermore, the present of complex infrastructure like the drainage system of Lothal shows the presence of a strong and stable government who were able to direct people to build the infrastructure. Also, the cities were divided into two areas: the lower town and walled upper town. The walled upper town is known the citadel. It housed big buildings which were probably the palaces, houses and offices for government officials. There were also large grain storage buildings indicating the presence of authorities which oversaw the collection and distribution of grains. The lower town was the place for the ordinary citizens to stay and do their day-to-day businesses.